As we hear regularly, the manufacturing sector is on the cusp of the 4th industrial revolution (4IR), bringing with it new technologies and techniques that will change the products, processes and supply chains involved in every aspect of industry. A new report out today from EEF and Oracle shows that the UK is off the starting blocks in the race to prepare for the 4th industrial revolution (4IR), with over four in ten manufacturers (42%) now saying they have a good handle on what 4IR will entail. But while industry awareness is growing, just one in ten (11%) say that the UK is geared up for this crucial next industrial age. This suggests that in terms of being ‘4IR ready’ there is still some way to go. The report, based on research findings and a series of focus groups, says that the majority of UK manufacturers are at the first stage of a three part 4IR journey that will take them from conception, through to evolution and, finally, revolution and goes in to detail on what that journey map could look like. It says that 4IR will herald smarter production, supply chains and products and will boost the number of high-skilled jobs in the UK, but warns that the speed of change will be unprecedented, leaving little room for complacency. Without industry and supply chain leadership, coupled with a supportive industrial strategy, the UK could be left behind. Manufacturers’ expectations are of a step change in connectivity and communication and in getting actionable insights from data. Over six in ten manufacturers (61%) say digital technologies will boost productivity, while three quarters (74%) say that 4IR will fundamentally change customers’ expectations. This in turn will require firms to change and adapt in order to meet marketplace needs, customer expectations and, of course, to remain competitive. Almost seven in ten (68%) manufacturers believe that 4IR will happen faster than previous changes in manufacturing. And while most are seemingly confident about managing the pace of change, almost four in ten (39%) are concerned about their firms’ ability to keep up. A further third (32%) are worried about the competition that will be brought about by this industrial change. Manufacturers are developing their investment strategies accordingly, with the main focus being on connecting up with supply chains and end customers, and enabling smarter production processes. Many are already optimising existing business processes. Early stage investments in the evolution phase are being considered or are already taking place with cloud solutions (66%), multi-purpose production lines (55%) and capital equipment with embedded sensors and analytics (54%) leading the investment pack. At the same time, the report says that the first step doesn’t have to be about making large investments in technology. Manufacturers can prepare for 4IR by changing their company culture to allow for greater innovation, adopting a visionary approach to leadership and giving their IT teams a more strategic business planning role. The EEF says, Government too has a role to play and should ensure that its new industrial strategy provides the right building blocks to enable UK manufacturing to successfully undergo this transformation. Lee Hopley, Chief Economist at EEF, commented: “4IR is happening and the UK’s success in this global industrial transformation will hinge on manufacturers’ strategies and ambitions. 4IR goes far beyond simply investing in new technologies and techniques – this new era requires cultural shifts, new business models and the ability to adapt and innovate. Above all, it requires strong leadership. 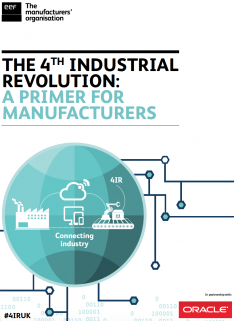 The report – The 4th Industrial Revolution – a primer for manufacturers – can be downloaded here.